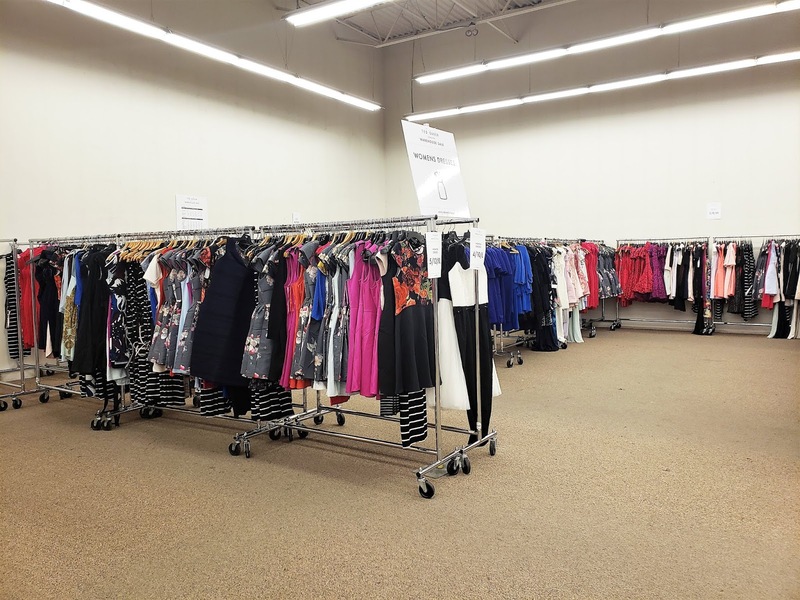 I'm not really obsessed with labels and brand names - at least not enough to usually shell out the cash for them...but I do love a good deal...so when an awesome warehouse sale comes to town, you can definitely count me in! Gotta dress for the shopping spree! No jumpsuits or dresses today - I wanted something that would be easy to change in and out of. Comfortable shoes too. The 'change rooms' are essentially a large squared off area - one for men, one for women - with fabric walls all the way around. So just be ready for a group changing situation. Here's a sneak peek at the price lists. There are some serious steals here!! 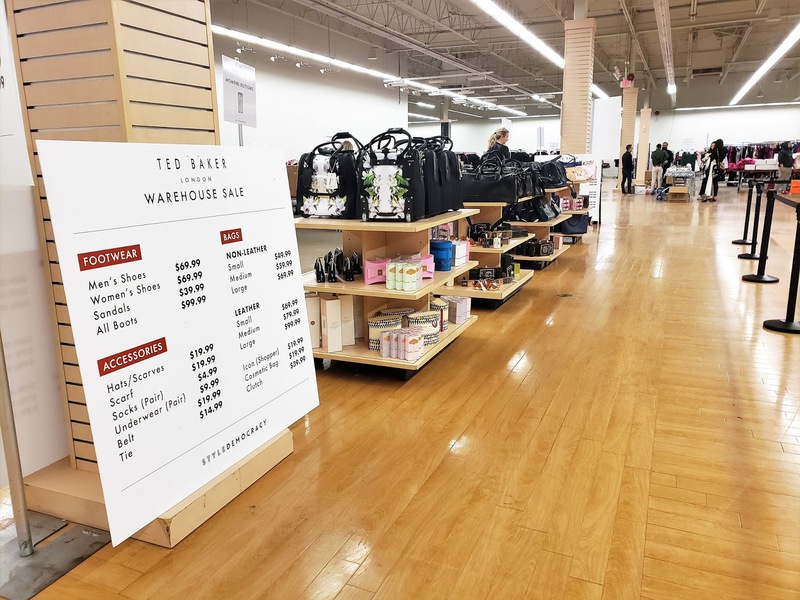 Ted Baker skirts are only $29.99. 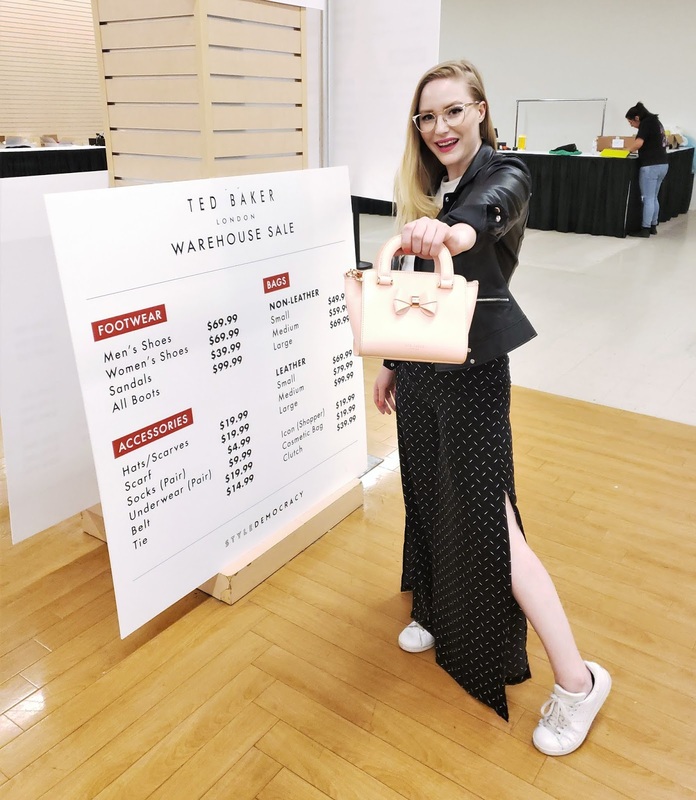 The cute little Ted Baker purses are $49.99. Daytime dresses are $69.99. Not bad, right?? The dress selection is killer! I had to remind myself of the Ted Baker sizing (which is very different from your standard sizing) - luckily there are handy charts on the wall. 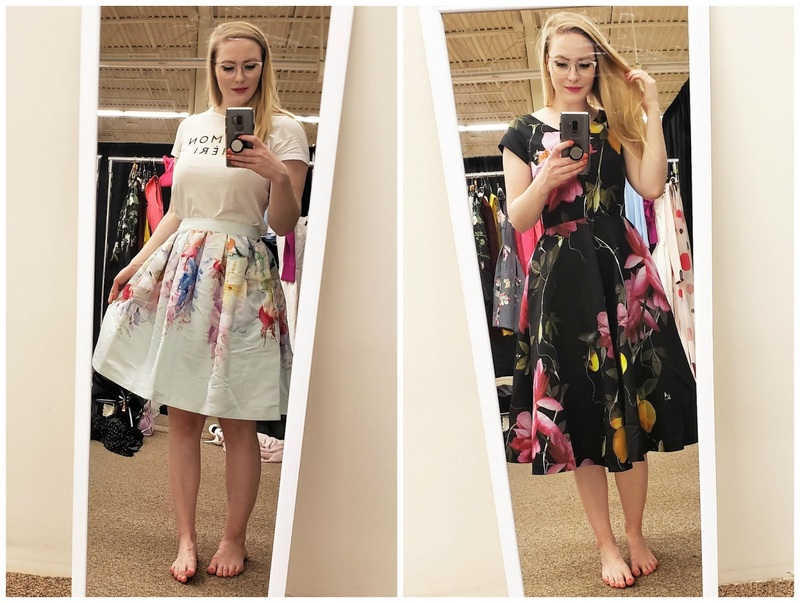 I'm generally a Ted Baker size 2 (the equivalent of about a regular size 4-6) and the selection was quite decent - size 3 had even more selection I noticed! The quality of Ted Baker dresses really is something else. So thick and luxe feeling. I can see why people would normally pay full price for these items. 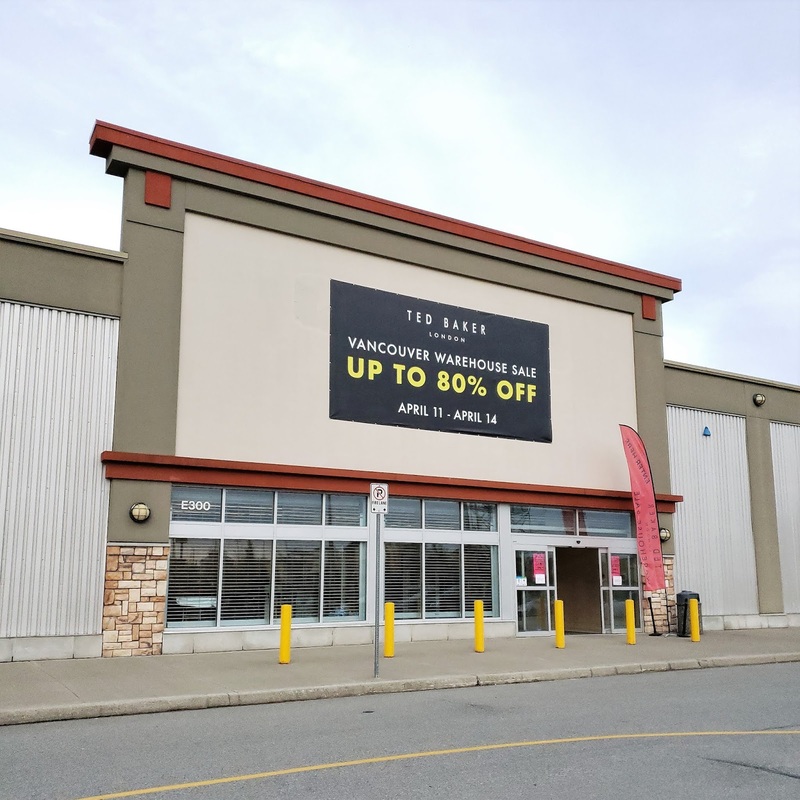 But hey, an 80% discount definitely seals the deal! I ended up bringing home the skirt on the left. It's going to be so perfect for afternoon tea! Sadly, the dress on the left was just a tad too tight in the shoulders and bust. I couldn't find a bigger size at the time. IF SOMEONE SEES IT IN A SIZE 3 PLEASE BUY IT FOR ME AND I WILL PAY YOU BACK!!! That dress is absolutely stunning. Here's a peek at the purse selection. 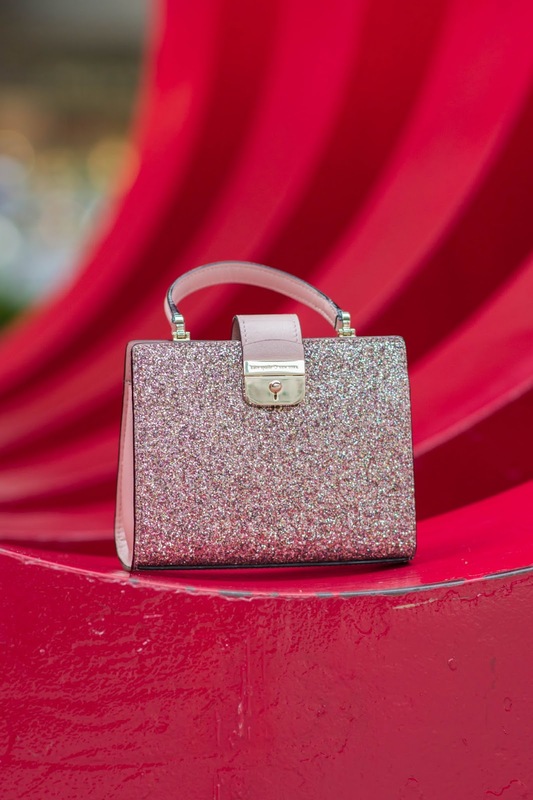 Some adorable small purses with cute little Ted Baker bows, and some beautiful roller bags that would be so awesome for someone's work or travel needs. I ended up bringing home the two bags on the left. The women's shoe section was a little small, but still some treasures to be bad. 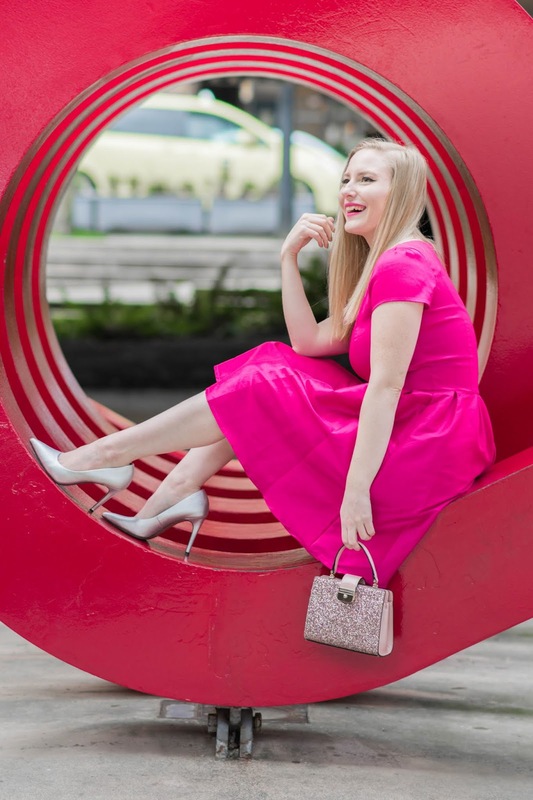 I love that Ted Baker signature style that you'll see in the navy heel below. In fact, I actually bought a similar pair in a floral print from the Nordstrom Warehouse Sale, and I just love the design. Those pointed floral sneakers were pretty fantastic too. I was pretty tempted by all the adorable other accessories and 'extras' they had for sale - everything from Ted Baker fragrances and jewellery to tea cups and phone cases. I was so close to bringing home that tea cup set. It was only $5.99!!! Broke my heart to not buy it, but let's be honest, I have zero space for more tea stuff. But what a deal! 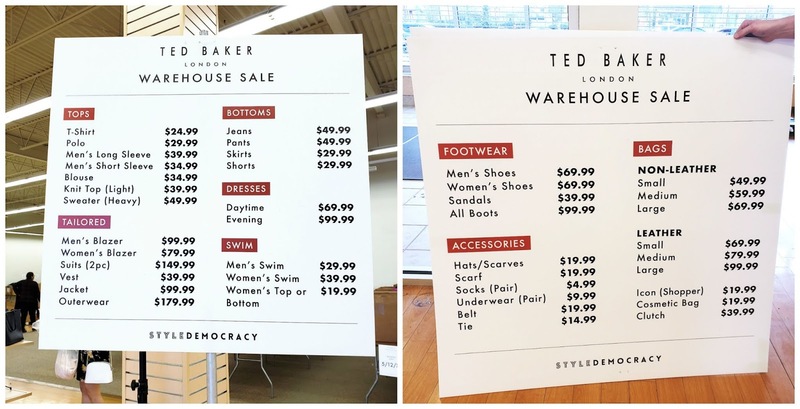 All in all, the deals at the Ted Baker Warehouse Sale are definitely worth checking out. 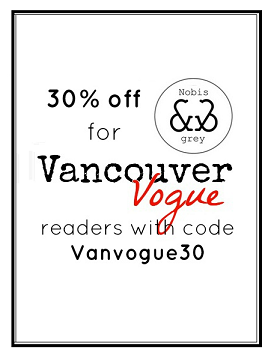 I anticipate the lines to be long, so go with lots of patience, and I think you'll find some fancy new goodies to love! 'Après' or 'Après Ski' has easily become one of the trendiest styles this winter. Before it became a chic trend though, it was really just meant to describe the time spent after a day on the ski hills (hopefully by a nice cozy fire, sipping a warm alcoholic beverage - see my post here for the perfect après ski drink). And now brands have dedicated themselves to coming up with the best clothing and accessories so you look incredibly stylish while celebrating the end of your day on the slopes...or just want to skip the slopes entirely and go straight for those après drinks! I was doing some shopping at Queensborough Landing in New Westminster over the holidays, and came across this beautiful sweater and toque at the Tommy Hilfiger Outlet that to me just screamed vintage après ski vibes. Sooo so cozy, and I love that they're in the classic TH colours. Turns out, I actually had some TH socks at home that I picked up on Boxing Day a few years ago, so I added those to the look too. The nice thing about Tommy Hilfiger, is that if you buy things in their signature blue, red and white colours, you can easily add new, coordinating items over the years. In case you hadn't noticed...I'm not exactly on a ski slope in the photos below. Sadly, I haven't had a chance to hit the slopes yet this winter, so for the purposes of showing you this outfit, we had to settle for the local skating rink instead! If you're planning on hitting the slopes this winter (or just enjoying the 'après' cocktails), I've linked up more of my favourite (affordable) après ski styles at the end of this post.! Gotta love a good candid with LegalLee Blonde! 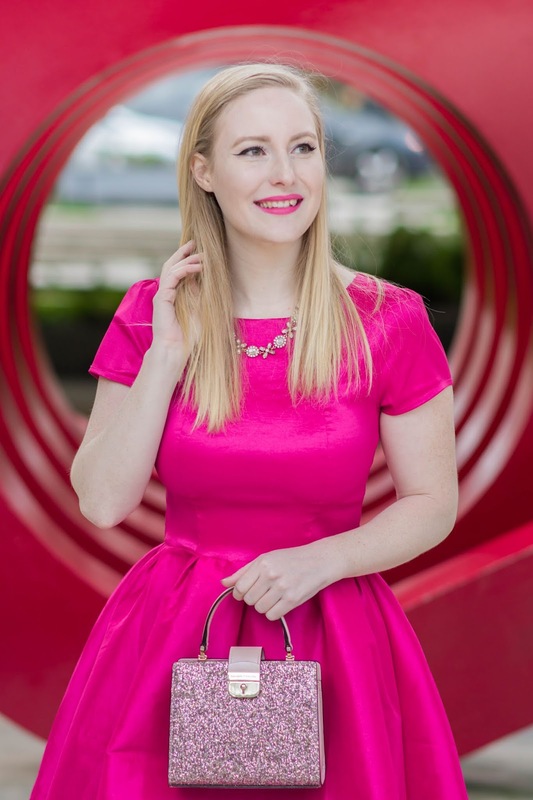 Ok to be honest, Valentine's Day or not, I've been dying to wear this adorable pink dress! So here's the funny story... I went thrifting at my favourite Value Village (if you're in Vancouver, it's the one on Hastings St. near Commercial Drive). 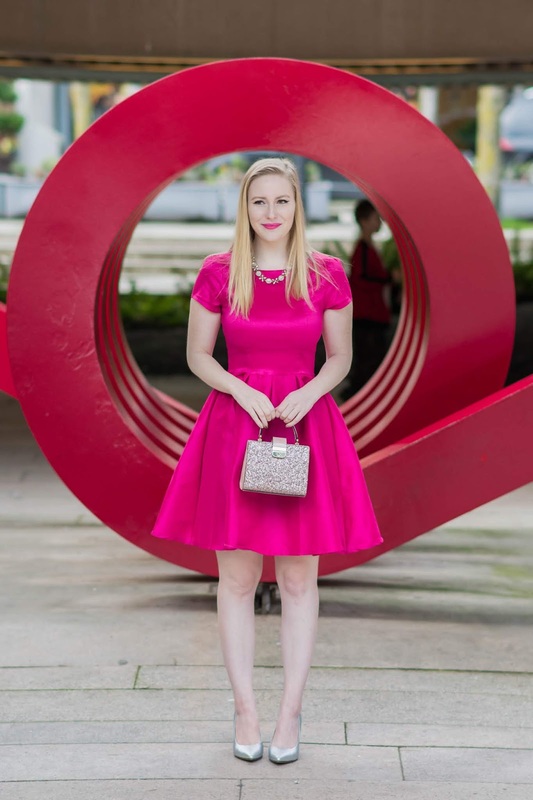 And I stumbled upon this gorgeous hot pink dress - definitely hard to miss amongst the rows of other dresses. I checked the tag: Shabby Apple for $17.99! They're a brand I've always wanted to try, having seen they're sweet dress designs online plenty of times. Needless to say, I was pretty excited about this find. I also remembered Leeanne (of LegalLee Blonde) had a similar dress a while back. Well, lo and behold...I went to shoot these Valentine's Day outfit photos with photographer Austin Mollins and Leeanne (we were doing another outfit shoot together)...and when I tell Leeanne I thrifted this great dress, she tells me that must be the dress she had, because she donated it recently! The perfect example of a clothing item getting a second life - to be loved once again...how fitting for Valentine's Day! Gotta love pre-loved fashion. Have you ever donated a clothing item, in the hopes that it'll go to someone else who will love it just as you did? 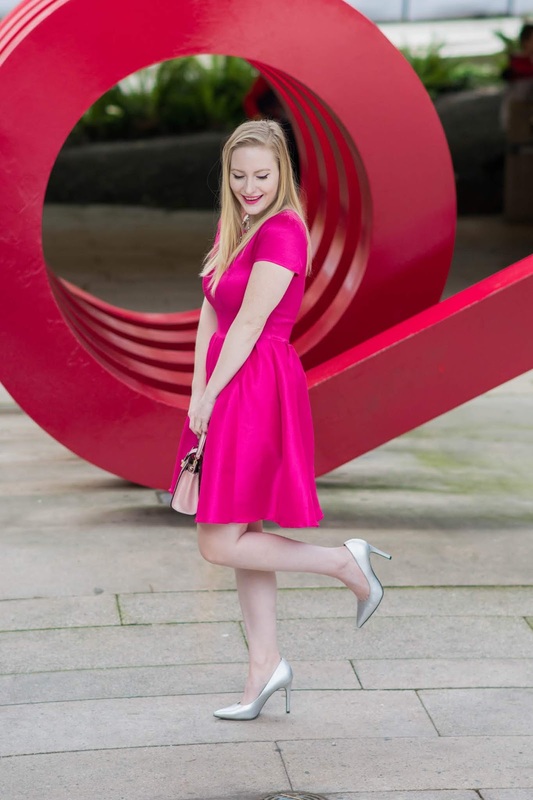 We're just days away from Valentine's Day, so I'm pulling out all my pretty pink makeup for today's look! 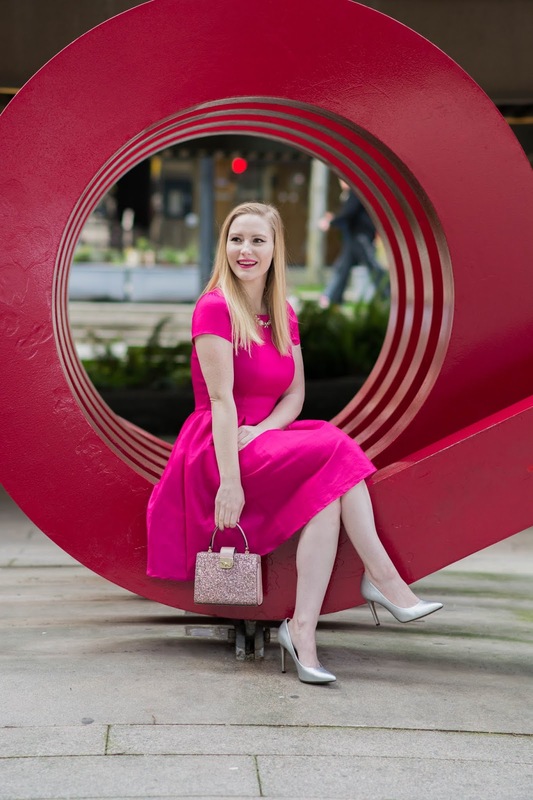 I think most people's Valentine's plans seem to be more on the low-key side, so rather than a dramatic look, I thought I'd create something more wearable that would work for a casual date night or a Galentine's celebration! All the details are below, just keep on scrolling! I've been looking for an opportunity to test run the new CoverGirl Exhibitionist mascara, so this turned out to be the perfect time. You know I'm a big mascara junkie, and CoverGirl was the first mascara (the old pinky-red 'Professional' bottle) I fell in love with. So I usually have pretty high hopes when they launch something new. Oddly enough though, when I gave this one a quick test, I felt a bit underwhelmed. It didn't really seem to add much volume (which is important for me). I ended up putting the cap back on and leaving it untouched for a couple of weeks. BUT...when I reopened the mascara to give it another shot with this Valentine's look, I found the formula was actually great! Lots of length and volume. Sometimes I do find some mascaras need some time to 'sit' after opening for the first time before they're good to go. This seems to be the case with the Exhibitionist. If you're patient, it's definitely worth the wait! No clumping, no flaking, no smudging all day, just beautiful lashes. Perfect for Valentine's Day. PS. In case you haven't heard...CoverGirl is now cruelty-free, and Leaping Bunny certified!! I also want to make sure to mention the eyeliner I used for this look, as it's been a looooong time since I gave a new eyeliner a shot. I'm very picky, and have stuck to my usual waterproof Annabelle Exaggerate Eye Liner for years now. I haven't had the best experience with marker-type liners in the past. They just always seem to be dried out and tug on the eyelid as I apply. But not this baby! The Makeup Revolution Renaissance Flick Eyeliner is fabulous. At least after a couple weeks of use, it hasn't dried out at all, and doesn't pull as I draw my usual cat-eye. The black colour is intense, and stays on all day with no smuding - even though it's not waterproof, like my usual liner. The other product I really wanted to feature in this look is the Annabelle Chrome Single Eyeshadow in Chromium (you can find it at London Drugs). I absolutely love this formulation. I picked up the shade Mercury a couple years back, which makes a simple yet gorgeous metallic smokey eye. The shade Chromium is a nice subtle, shimmery light pink, which is equally as gorgeous. The texture of these shadows is creamy (despite them looking more like a powder in the package). I just apply them to my lids using my finger to dab on the pigment. Lastly, it's all about the lips! 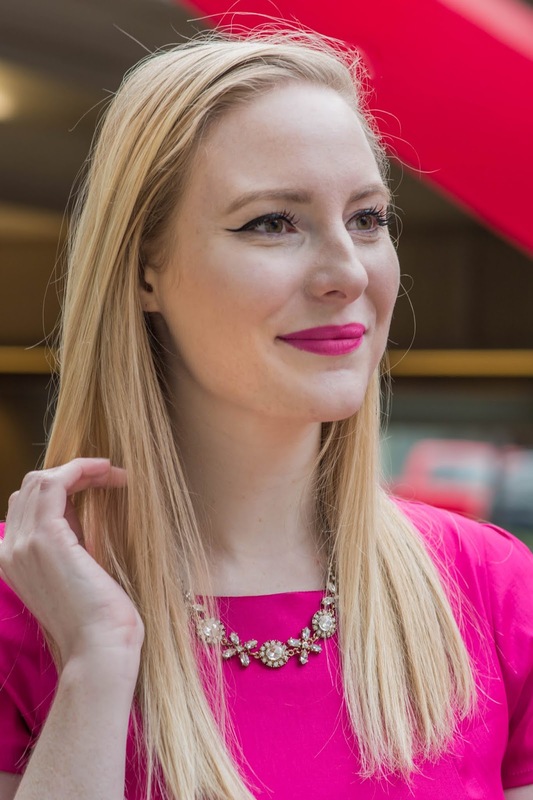 Rimmel's Stay Matte Liquid Lipstick is one of my favourite matte lipstick formulations, and the shade Rose & Shine is such a lovely shade of pink for this Valentine's Day look. It has a nice light scent (reminds me of the Rimmel lip glosses I had as a kid), and it feels so comfortable and not at all drying on the lips. Oh I lied - one more thing!! I wanted to give my nails a little TLC, using Essie's new Treat Love & Colour Strengthener in the shade Sheers to You. Rather than a regular clear strengthener, this one has such a pretty subtle pink shimmer to it. It's nice and low maintenance because it's still so sheer, but it also stayed on quite well throughout the week. It's a great way to show your nails some love. I've also linked to the rest of the products I've used for this pretty pink look - foundation, contour, etc. so you can find all of those below!